On his appointment as Brazilian Minister of Culture in 2004, the legendary musician Gilberto Gil launched a programme known as Cultura Viva – Living Culture. 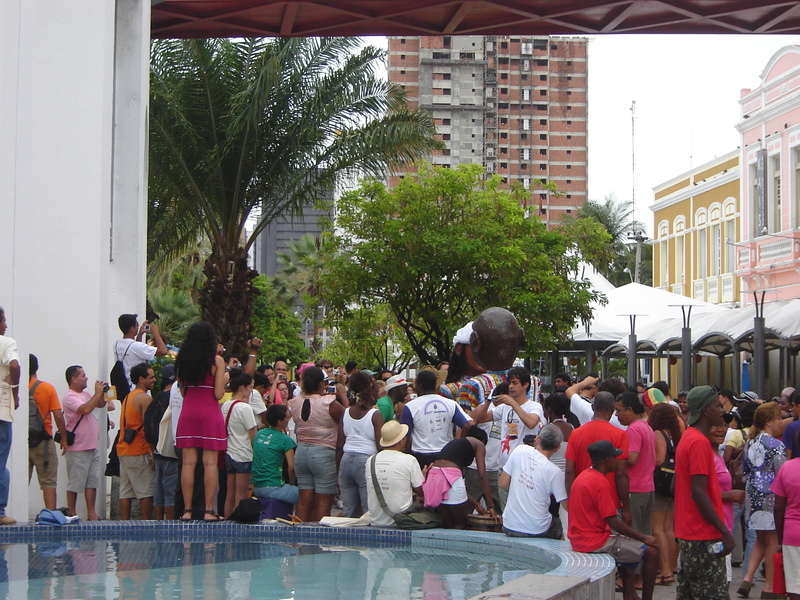 Gil’s Secretary of Culture, Celio Turino, developed a system called ‘Pontos de Cultura’ – Cultural Points: Gil described Cultural Points as “sharp interventions into the depths of urban and rural Brazil that aim to awaken, stimulate, and project what is characteristic and most positive in communities in marginalised societies”. The aim was to build a programme based on “what already exists and works legitimately within the community… local bodies, organisations and mechanisms that can be strengthened, improved and continuously evaluated.” Gil said “I’m not talking about giving people fish, nor about teaching people how to fish. I am talking about enabling the ‘fishing’ that has been going on for a long time, especially in areas prone to social vulnerability”. There are now more than 2,500 Cultural Points, each receiving around £48,000 to develop activities according to what it needs and wants to do, usually a continuation of existing practices, in some cases never previously remunerated. Approximately 10% of the funds must go towards the purchase of multimedia equipment that is supported by free software provided by the Ministry. The idea of building on existing community cultural activity rather than always starting something brand new and offering funding with little stipulation about how it should be used, trusting that the groups selected as Cultural Points will use it in a way that will create a positive social impact, fascinated me. 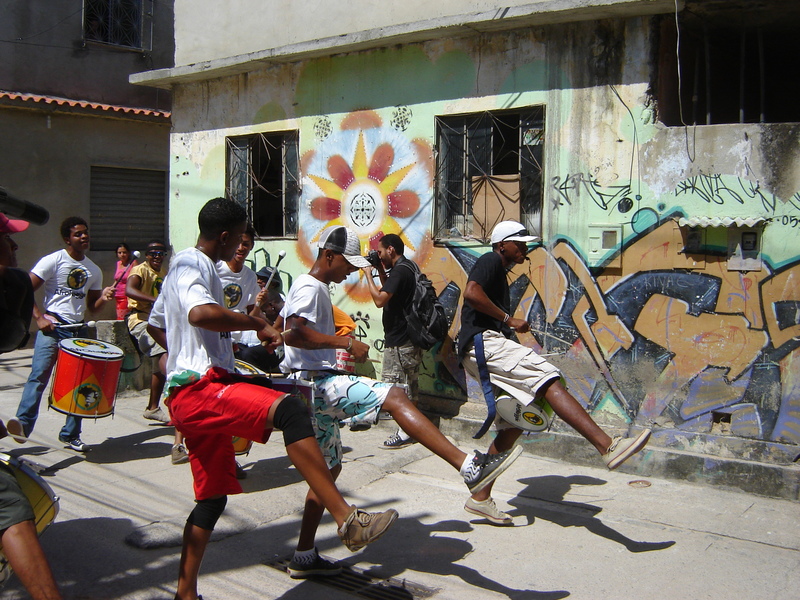 I was very excited to be offered the chance to visit Brazil to learn more about Pontos de Cultura as part of ‘Points of Contact’ – an exchange programme between the UK and Brazil organised by People’s Palace Projects (and funded by the British Council, Arts Council England and the Brazilian Government). A dozen British arts organisations have been twinned with Brazilian Cultural Points with the UK representatives visiting their Brazilian colleagues in March and return visits to the UK happening in July. I was invited to join a small group of policymakers and funders to visit Brazil during the initial exchange visits. Our group included Mick Elliott, Director of Culture at DCMS, together with senior representatives of Arts Council England, the London Organising Committee for the Olympic Games, Liverpool City Council, the Calouste Gulbenkian Foundation and the Paul Hamlyn Foundation as well as two Clore Fellows. It was great for Voluntary Arts to be included in this company – not least for the opportunity to network with the other members of the group. 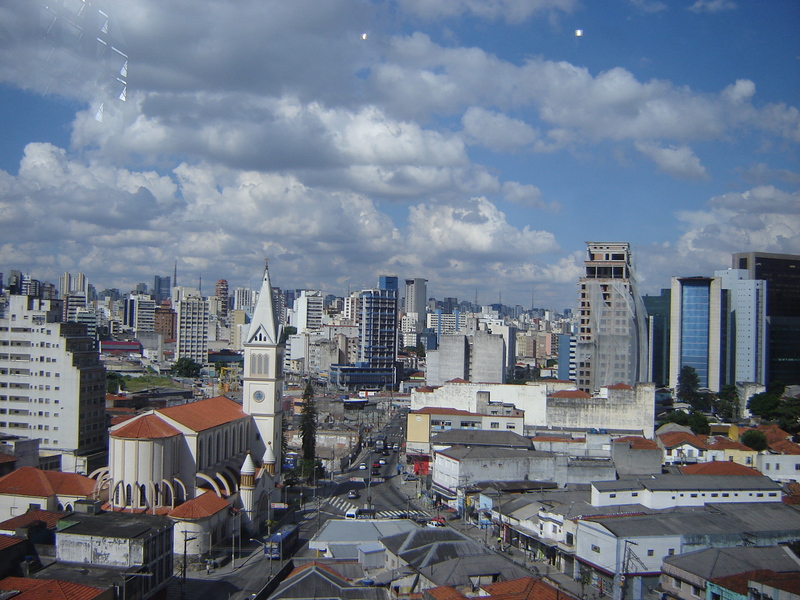 Our visit started in Sau Paulo – the fourth largest city in the world with a population of 20 million people. We were taken to see a range of cultural facilities and organisations and took part in a formal seminar with the Secretaries of Culture for the State and the City of Sao Paulo. From Rio we flew to the North East of Brazil to the city of Fortaleza to join the Teia (literally ‘the web’) – the biennial festival of the Pontos de Cultura. Representatives of most of Brazil’s 2500 Cultural Points had travelled from across this vast country for a week of celebration, performances, demonstrations and discussions. It was wonderful to wander around the Dragão do Mar complex, stumbling upon an amazing diversity of cultures and activities. I had been particularly hoping to hear some forró (“the hip-swiveling, dancefloor-filling, rural party music of Brazil’s northeastern states”) in its natural habitat – and I wasn’t disappointed. It was also great to see such a mass of voluntary artists celebrating the cultural activities developed in their own communities. The Teia is a unique event but if you could imagine transplanting The Gathering or the National Eisteddfod to somewhere just south of the equator you wouldn’t be too far off! I had a brilliant time in Brazil but the real value of the trip will be in what happens next. 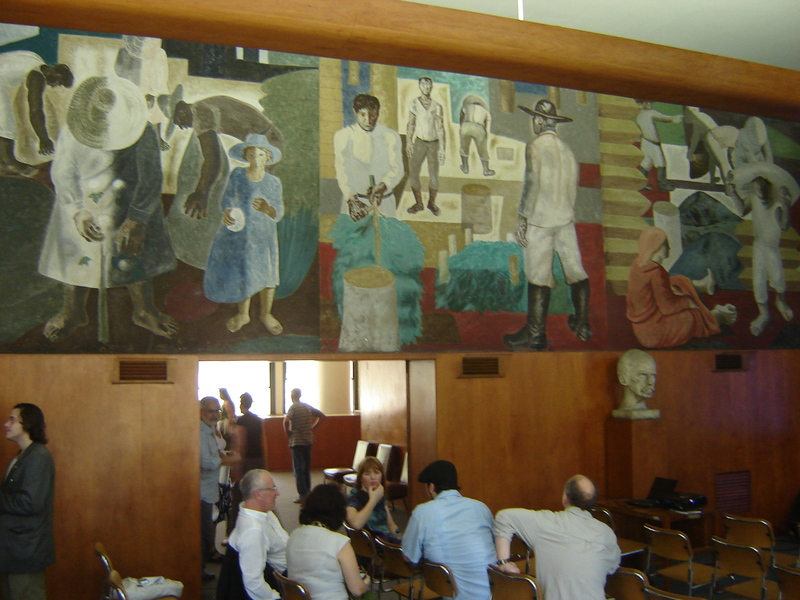 As we prepare for the return visit by the Brazilians in July our policymakers group will be meeting to discuss whether the Pontos de Cultura system might provide models we could adopt in the UK. I think I left Brazil with more questions than answers and some scepticism about the replicability of the scheme – though it is obviously producing fantastic results in Brazil. But I do feel inspired to continue the debate and I think we have the beginnings of a strong alliance with the other UK organisations in the group which may produce some exciting results for the voluntary arts sector. I am incredibly grateful to Mick Elliott for the chance to be part of the policymakers group and to everyone at People’s Palace Projects for organising such a truly wonderful experience. Particular thanks must go to the amazing Paul Heritage – the inspiration and driving force behind ‘Points of Contact’. On Tuesday afternoon I chaired a seminar on ‘Arts Participation and Social Cohesion’ at the Department of Communities and Local Government in London. We had gathered representatives of four Government departments (DCMS, DCSF, BIS and CLG) as well as officers from Arts Council England, the Museums, Libraries and Archives Council, English National Opera, the Legacy Trust UK and a range of music organisations for what was a fascinating discussion about the role that the arts can play in community development work. We heard about CLG’s interest in community choirs as a mechanism for meaningful interaction. Making Music and SoundSense told us about ‘Vocality’ – their collaborative project to develop 60 community choirs over the next 3 years. We also discussed the synergy with the informal adult learning work going on at BIS through The Learning Revolution, including the MLA’s work to open up spaces for informal learning activities, as well as possible links between current initiatives being run by ACE, the Legacy Trust and DCSF. One recurring theme was the need to avoid pigeon-holing activities as either ‘arts’ or ‘community engagement’ and to look at bringing together organisations with relevant expertise from each of these angles. On Tuesday afternoon I met Phil Chamberlain, Director of Strategy & External Relations at the Legacy Trust UK. We talked about the eclectic range of regional and national projects that have been funded by the Legacy Trust and the challenge they face in trying to get people to understand that all these projects are a direct result of London hosting the 2012 Olympic and Paralympic Games. The Legacy Trust is keen to break down the perceptions that London 2012 is only about London and only about sport. We discussed the possible links between the Legacy Trust’s ‘Somewhere To’ youth campaign (which aims to open up spaces for a range of activities for 16 – 25 year olds) and both the Voluntary Arts Ireland Young Arts Creative Co-operatives project and The Learning Revolution ‘open spaces’ scheme. We also talked about the Voluntary Arts Scotland Make a Splash! Project, which is funded by the Legacy Trust as part of its Scottish project. And we discussed the Trust’s Community Celebrations grant fund, the deadline for applications to which has just passed. It was a very encouraging meeting and we identified a number of ways in which we might be able to work together in the future, including the possibility that the Legacy Trust might be able to provide us with evidence of the impact of arts participation from the evaluation of some of its funded projects. On Tuesday I was at Tate Modern in London to take part in a DCMS seminar on ‘Encouraging Digital Access’. The focus of the seminar was mainly on how cultural institutions could be making more use of digital technologies to extend access to their (publicly owned) cultural assets. Opening the seminar, the Culture Minister Margaret Hodge spoke about the importance of the digital agenda in relation to extending audiences, extending participation and deepening the experience of individuals. The Minister suggested that most arts organisations currently use their websites just to provide information about their physical offering. She encouraged cultural institutions to discover the shared advantage created by co-operation with each other. DCMS had engaged Jonathan Drori to draft a guidance document on ‘Encouraging Digital Access’. Jonathan, who chaired Tuesday’s seminar, said he was trying to get to a step change in the way the public engage with the wonderful things in our cultural institutions. The leaders of a range of cultural institutions, including the British Library, the Royal Opera House, the Royal Shakespeare Company, the Sage, Gateshead, the Cornerhouse in Manchester and the Watershed in Bristol, took part in the seminar to share details of their progress in increasing digital access. This morning I was in Dewsbury to speak at the first of 9 regional stakeholder meetings as part of the Community Media Association Arts Project. This meeting brought together local authority arts officers, Arts Council England officers and representatives of other institutions and funders from across Yorkshire to discuss how community media organisations, arts organisations and artists might work more effectively together. Denise Fahmy from ACE was keen to encourage the arts sector to meet the digital challenge – working with community media organisations to create new content and reach new audiences. She emphasised that ACE wants more people to take part in the arts and said she felt community media was a great way to do this. Tamar Millen from the Community Media Association stressed that many community media organisations are already working with arts organisations but she thought there was much more potential in this area. CMA Chief Executive Jacqui Devereux explained the ways in which community media organisations are particularly well equipped to increase participation: they are trusted, flexible, local organisations engaged in intercultural and intergenerational dialogue, often working in a variety of community languages – a good way of reaching those sections of the community who do not go to theatres, concerts or galleries. We then heard three fascinating presentations from local community media organisations. Seven is a community TV station in North East Lincolnshire which runs a training programme using the television production process to equip hard-to-reach groups with a variety of soft skills. West Hull Community Radio runs a weekly 60-minute arts show which interviews both professional and amateur local performers and producers. Bradford Community Broadcasting undertakes outside broadcasts covering local arts events at least once a week. Looking at these particular examples in detail it was obvious how much voluntary arts organisations have to gain from developing relationships with community media organisations – in order to promote their activities, to provide a platform for disseminating their work and to develop collaborations to create new artistic content for broadcast. The Community Media Association Arts Project will be organising a series of regional roadshows around England later this year to provide opportunities for arts groups to meet community media organisations.